PLEASE NOTE: This book is written for COMPLETE BEGINNERS. Those that have just set up their first blog and are now struggling with the next steps and where to go from here. It was written in response to feedback I received from my first book, which teaches the technical set up to complete beginners. I noticed patterns of what people were struggling with - often just even deciding what topic to focus on - and how blogging works in general. This book will take you by the hand and guide you through the next steps - the solid, basic techniques that every successful blogger started with. There is no magic pill to suddenly attract thousands of followers - although there are a few techniques that can speed things up and we will cover them. Another area that is often underestimated is learning the WRITING STYLE OF BLOGGING, including how to format your posts. This book goes into detail and provides resources for further training as that is obviously not something you will learn overnight. We will also look at the characteristics of Viral blog posts, but - once again - don't expect a magic pill! Blogging is hard work and becoming a good blogger - a good blog writer - takes training and time, even if you are already experienced in writing. People read blogs differently than books and unless you adjust to that, you will have a hard time attracting an audience - no matter how experienced a writer you are. Finally, we wil go over the basic monetization strategies that are available to bloggers. 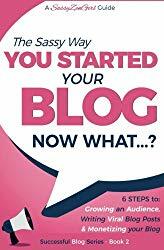 If you are new to blogging and are willing to put in the necessary work - and do so consistently - this book will give you a good basic start and take out much of the confusion new bloggers face. Of course, blogging also involves the powerful marketing techniques of SEO and Social Media and they are discussed in depth in part 3 and 4 of this series. I have personally found Kindle Publishing to be another great way to grow a blog following quickly - faster than any other technique actually - and so it is included as part 5 of this series. Once again - if you are looking for advanced techniques, this book will not be for you - it is specifically aimed at beginners who have just started their first blog. __________________________________________ STEP-BY-STEP: A Proven, Easy-to-Follow System for Taking your Blog form Zero to Successful You have started your blog, but don't know what to do next? You wonder how to attract readers and subscribers - and how to set up your blog for optimal conversion. You would also like to earn some money with your blog and promote your services and products. This book will teach you how to start a cool blog the smart way - no prior experience is necessary - and you might even have fun along the way…. Building a Foundation for Success This is what we'll cover: YOUR FREE GIFT - How to pick a Marketable Name for your Blog CHAPTER 1 - Finding a Blog Topic that People Actually Want to Read... CHAPTER 2 - How to Find Viral Blog Post Ideas CHAPTER 3 - The Writing Style of Blogging CHAPTER 4 - How to Drive Traffic to your Blog CHAPTER 5 - How to convert traffic into Subscribers CHAPTER 6 - How to Make Money with Your Blog BONUS Chapter - How to Become a Travel Blogger Would You Like To Know More? Download now and start your blog on a path to success! Scroll to the top of the page and select the BUY button.